For pasta?? 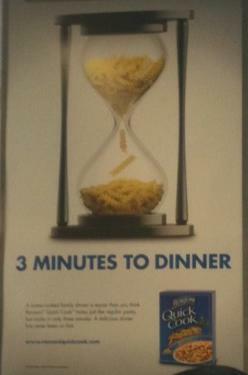 How long does pasta normally take to prepare? If you give me a pot of boiling water, some fresh pasta and a jar of tomato sauce, I’m positive that I can also create dinner in three minutes. The point is that there’s a huge psychological difference between “easy” and “incredibly easy.” This is why we’re better off asking people to do only one thing, because each subsequent step, no matter how easy, is nevertheless a step. It’s not about how difficult the whole process is (cooking fresh pasta), it’s about how difficult the whole process is and how many perceived steps it has (Rice-A-Roni Quick Cook). “Once and done” feels categorically different. Get a decision from your boss What do you think? Here’s what I think we should do. Let me know if you disagree. Get someone to make a donation We’d love if you could help in any way you can We need 10 donors to give $25,000 each to hit our goal. We have 8 already. Can I sign you up? ‹ PreviousWhere does your organization start and end? Next ›Why are you staring?